This publication is the first of a three-part series on spinner-disc spreader operation. This series provides insights into proper operation, calibration, and spread uniformity assessments of commonly used spinner-disc spreaders. Spinner-disc spreaders are commonly used to apply granular fertilizers and lime within crop production systems. They provide the ability to surface apply granular products and if maintained and operated properly, enable accurate placement of fertilizers. 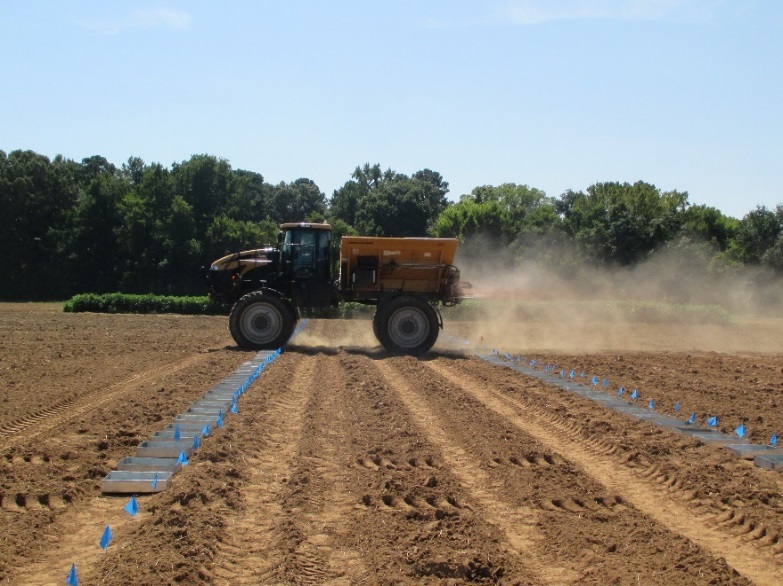 Three important aspects of accurate spreading with these applicators include (1) accurate metering of the material, (2) correct material delivery onto the spinner-discs, and (3) uniform distribution of the material across the swath. In order to achieve expected application accuracy with spinner-disc spreaders, proper calibration is required. This is especially true when changing either (a) the type of product being spread, whether an individual product like potash or a blended product like 19-19-19, or (b) the target application rate such as with variable-rate application (VRA). 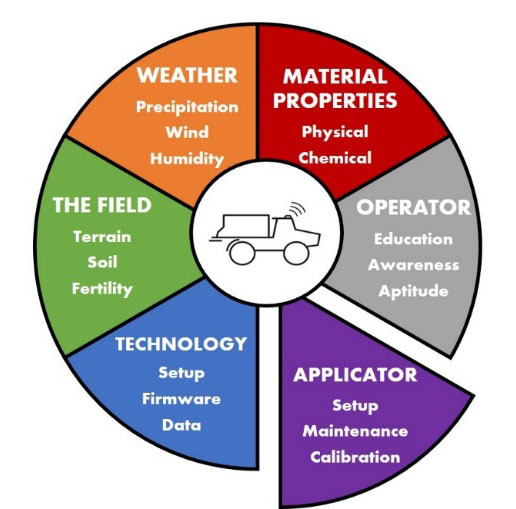 Figure 1 shows that set-up, maintenance, and calibration of spreaders are important components in preparing the application equipment for accurate fertilizer application. Operating conditions such as terrain, soil surface conditions, environmental conditions (e.g. wind speed, humidity), spinner-disc speed (RPM), product characteristics (granule size, granule structural integrity, granule size uniformity) and varying ground speed can impact spreader performance. This publication outlines standard procedures for calibration of spinner-disc spreaders commonly used in agriculture. Accurate metering. Material metering is primarily controlled on the spreader by feed gate height and belt/chain speed for spinner-disc spreaders. Manufacturers generally provide recommendations for feed gate height by product categories (e.g. fertilizer or lime) based on the desired application rate (lb/ac). Rate controllers required calibration of the metering mechanism to insure accurate application. Rate controllers use a calibration number which can be changed to adjust the rate output (e.g. lbs/sec, tons/sec, etc.) to within an acceptable error of 5% or less. Correct delivery of material onto the spinner-discs. 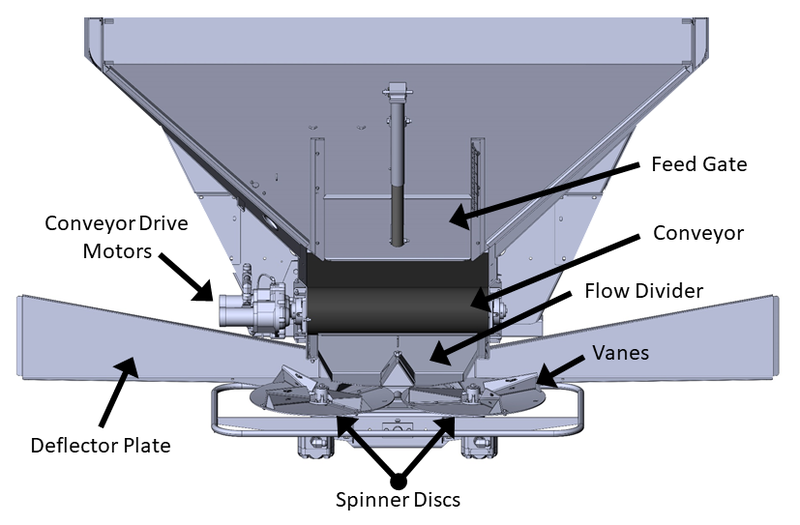 Adjustments can be made by moving the relationship of the flow divider to the spinner-discs, which in turn changes material distribution behind the spreader. Uniform distribution across the swath width. Flow divider position relative to the spinner-discs along with spinner-disc speed and vane pitch are important for uniform distribution. For this document, the following terminology for spreader components will be used (Figure 2). During spread pattern testing and calibration, accurate spacing of swaths is essential and requires evaluation of the effective swath width, then careful driving to maintain consistent spacing. Swath spacing should be the same as the determined effective swath width (drive spacing) and can change based upon the type of material being spread. Operating the spreader at the proper swath spacing is important to maintain the required pattern overlap and thereby uniform distribution across the entire field. Guidance technology such as a lightbar or autoguidance system improves the likelihood of maintaining proper spacing between adjacent passes. Additionally, spreader operators should minimize quick acceleration and deceleration since it can take a few seconds for the rate controller to adjust and maintain the target application rate. Operators should review the operator’s manual to become familiar with the applicator and ensure adjustments, maintenance, and repairs are handled appropriately. See Part 2 of this three-part series for information on correcting irregular spread patterns. Part 3 provides definitions for terminology used in this series, as well as important operational tips and considerations. Calibration checks should be conducted for each material applied. Two separate calibration tests should be conducted. First the accuracy of the metering system should be checked. Second, a standard pan test needs to be completed to evaluate the spread pattern uniformity. The metering calibration should obtain results that are within 5% (1%–2% is attainable) of the target amount. This test ensures the application rate (kg/ha, tonnes/ha, lbs/ac, or tons/ac) will be met during field operation. The standard process is to collect the amount of material off the conveyor belt or chain by either driving over a known distance (ground drive spreaders) or using the in-cab display calibration procedure and collecting material with the spreader in a static position (e.g. in a loader bucket). The amount collected is then compared to the amount expected to be discharged from the conveyor. Upon comparison of these results, setup can be adjusted accordingly to reduce the conveyor metering error to less than 5%. A few methods exist for ensuring the amount of material being conveyed matches the preferred target rate. One method is to raise the wheels off the ground with a jack or hydraulic lift ensuring the spreader is level. Then rotate the wheel a known number of revolutions while collecting material off the conveyer chain or belt for weighing. Computing the distance traveled by the known number of drive tire rotations (and knowing the tire circumference) will allow the operator to adjust the gate height in order to match the target application rate. For spreaders equipped with a rate controller including those that use variable-rate technology (VRT), the metering system calibration can be completed in a static position with material captured in a large bin or similar container (e.g. in a loader bucket). The manufacturer of the rate controller usually provides an outline of the calibration process in the operator’s manual. Additionally, meter calibration can be completed during field application by spreading a previously weighed amount of product (lbs or tons) over a known area (such as acres). Rate controllers can provide an accurate measurement of the covered area while estimating the amount of product that was spread. The amount of product in the spreader should be checked with certified scales before and after the application. If the amount of product (lbs or tons) delivered to a field is known and the field area is known (acres), the amount delivered divided by field acreage provides a check to the controller’s application rate calculations. Collection pans (between 1 and 3 ft2 in area, 4 to 6 in. deep) with a gridded baffle (half of the total collection pan height) placed in the bottom of the pan. Collection pan size should remain consistent for all pans included in the test. See Appendix 1 for pan construction. Test tubes for each pan, approximately 100 ml size and numbered the same as collection pans. It is helpful to have a test tube rack and funnel. An alternative to using test tubes is to weigh each sample using a scale that measures to 0.1 or 0.5 gram resolution. 100 to 200-foot measuring tape. Flags for marking pan locations. Figure 3: Example collection pan with baffle inserted to reduce particles ricocheting out of pan. Figure 4: Example pan test being completed for a spreader. Operators need to double check that spinner discs are operating at the correct speed (Revolution Per Minute, or RPM). This process can be completed by using a handheld tachometer. For dual spinner-disc spreaders, speed should be similar between the discs and readings should not vary more than 10 RPM. Additionally, verify that the actual speed matches the value on the in-cab display. In some cases, the in-cab display and associated control system for the spinner discs may require a calibration process as outlined in the operators manual. Spinner disc speed is critical to maintaining uniform spread and correct swath widths. If significant speed variations exist between the two discs, or if the in-cab displayed disc speed does not match the actual disc speed, spread patterns can become skewed. It is recommended to purchase a handheld tachometer and check disc speed before the application season, and periodically throughout the year. All collection pans should be placed on 2.5-ft intervals with pans on either side of the center pan removed to allow for unobstructed passing of the spreader tires over the pan array (Figure 5). Research has indicated a 2.5-ft pan spacing is necessary to correctly determine the spread pattern. 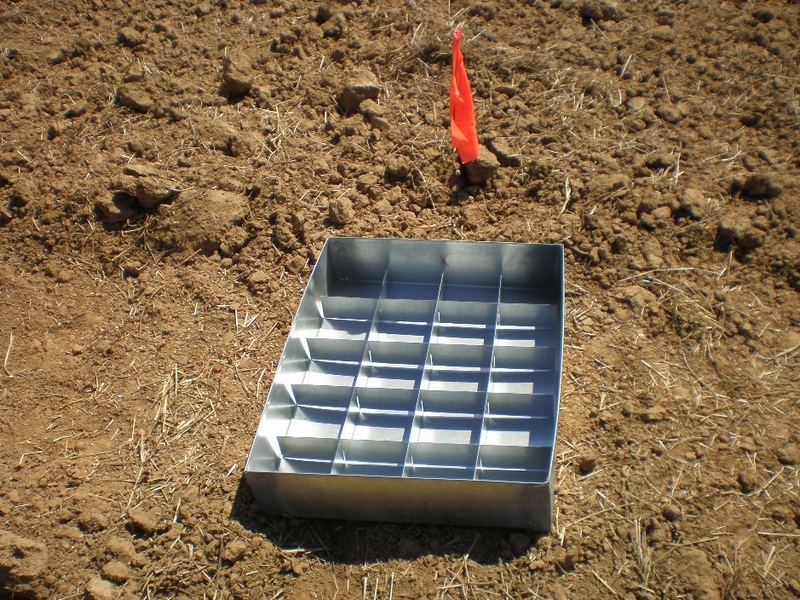 Each pan should have a gridded baffle to prevent fertilizer from bouncing out (Figure 3). Pans should be level during tests. (remove center pan for three-wheeled spreaders). The size of the pans and test tubes should be in proportion to the rates of application being checked. All pans must be of identical size and shape to ensure consistent particle capture. Remember, the test pan array should always be setup in a level field.